Click Here for our Body Odor Solution! The odor from Underarm sweating is the most pungent kind of sweat that your body produces. This is because the sweat glands in your armpits produce a different kind of sweat than those in your back or chest. The glands in your armpits are called apocrine glands and they are known to produce thicker moisture that has a milky or yellow color. This is what causes the yellow stains on your garments and extreme body odor. Body odor can be an embarrassing and persistent problem if you suffer from excessive body sweating issues. It can even lead to social phobias. At Kleinert's, we know that you hate to sweat, and you hate to smell even more. That's why we've created dozens of products to protect your underarms and feet from bothersome odor produced by sweating. Foot sweating can also cause odors that are annoying and strong. Because feet are often housed in warm, moist spaces (your socks and shoes), they create an environment ideal for bacteria and fungus. This is what causes odors and can further generate problems associated with athlete's foot and other infections. To combat body odor in the underarm and other places, we offer you several products for underarms as well as feet, chest & back. Since 1869, we have been perfecting an entire line of dress shields, garment shields, shoe insole inserts, sweatproof undershirts and clinical antiperspirants (Doctor Recommended) and more that are patented and unique. 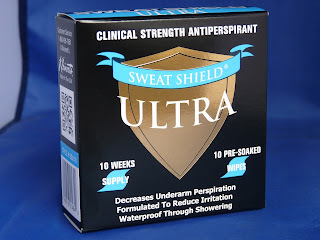 They include stainproof and waterproof materials that draw moisture away from your armpits, chest, back and feet to prevent the emanation of odors. Excessive Sweating and Odor Solutions!